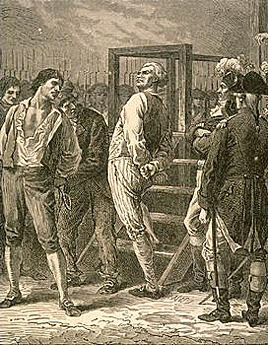 On this date in 1790, Thomas de Mahy, Marquis de Favras, became a penal milestone: the first French noble executed without class distinction from commoners. At least he made history. 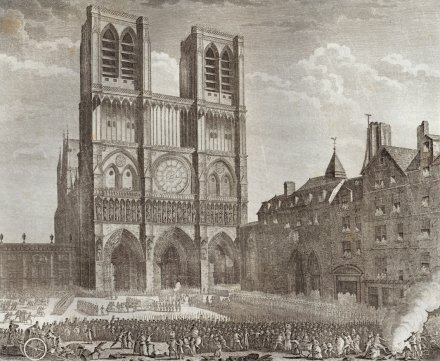 The scion of an ancient and penurious noble line, Favras was trying to make a different kind of history: he’d hitched onto a plot of the future Louis XVIII to reverse the still-infant French Revolution and rescue the king and queen from captivity in the Tuileries. The royal couple were ultimately destined to escape this palatial dungeon only to the guillotine. But in Mahy’s day, it was possible to dream of counterrevolution. And that terrifying machine of the revolution hadn’t even been invented. For that matter, the machinery of revolutionary justice had also not been born; this was Lafayette‘s year, the revolution in its moderate phase. The crowd was said to be quite enthusiastic. 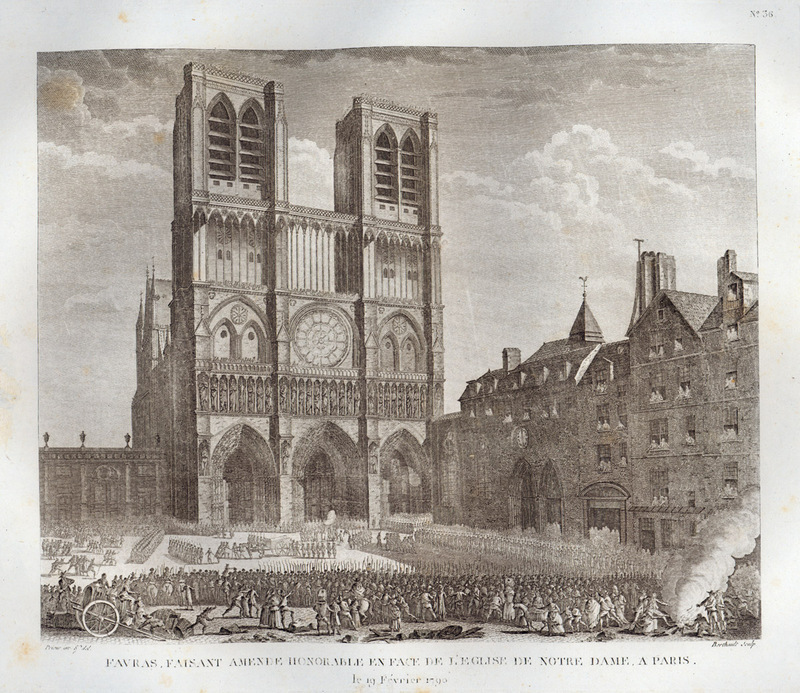 “Thomas de Mahy, Marquis of Favras Making Honourable Amends before Notre-Dame,” engraving by Pierre-Gabriel Berthault (French link). You’ve got to look forward, not back. 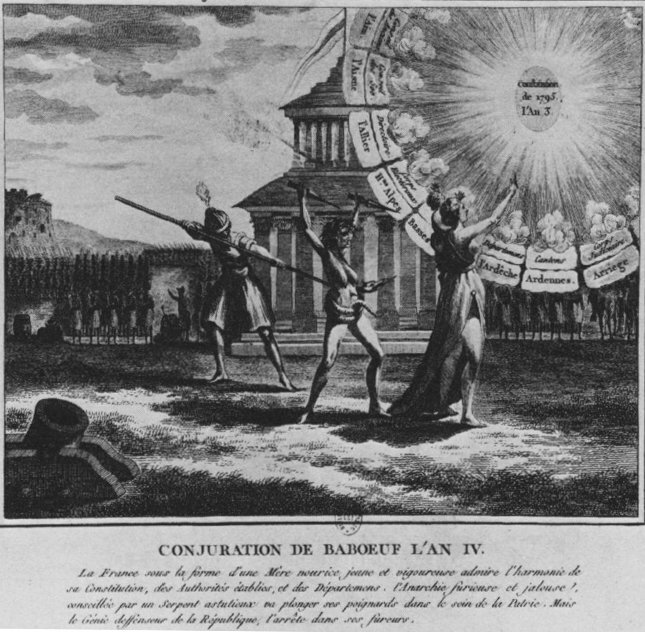 * Barry Shapiro, “Revolutionary Justice in 1789-1790: The Comité des Recherches, the Châtelet, and the Fayettist Coalition,” French Historical Studies, Spring 1992. On this date in 1795, the attorney who had engineered the Terror was guillotined for engineering the Terror. 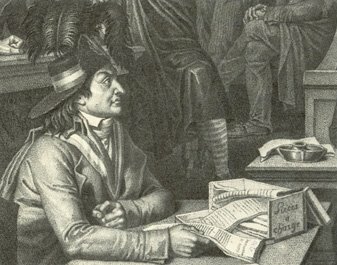 Antoine Quentin Fouquier de Tinville (English Wikipedia page | French), or just plain Fouquier-Tinville, had emerged during the Revolution from penurious obscurity to wrangle a jury foreman’s position courtesy of his connection to Camille Desmoulins. When Desmoulins ally Georges Danton spearheaded creation of a Revolutionary Tribunal (French link), Fouquier-Tinville drew the choice gig of Public Prosecutor. From that perch, he would supply the arbitrary exercises of the Committee of Public Safety their (increasingly scanty) scaffolding of formal legality in Paris’s greatest show trials. Heck … when the Terror ended, our good state’s attorney even signed off on the execution of Robespierre, with what must have been a lump in his throat. He was himself denounced within days, and narrowly preserved from the summary justice of his fellow-prisoners upon incarceration. This varietal of the only-following-orders defense did not impress in Fouquier-Tinville’s case; the Public Prosecutor had made the role too much his own. I have been told by a gentleman who was at school with Fouquier, and has had frequent occasions of observing him at different periods since, that he always appeared to him to be a man of mild manners, and by no means likely to become the instrument of these atrocities; but a strong addiction to gaming having involved him in embarrassments, he was induced to accept the office of Public Accuser to the Tribunal, and was progressively led on from administering to the iniquity of his employers, to find a gratification in it himself. And, indeed, he was condemned by his own hand. His lawyerly letter to the Convention during Danton’s trial — “the accused are behaving like madmen and demand the summoning of their witnesses … our judicial powers do not furnish us with any means of refusing” — duly elicited those heretofore absent powers, which the prosecutor immediately deployed to gag the defense. 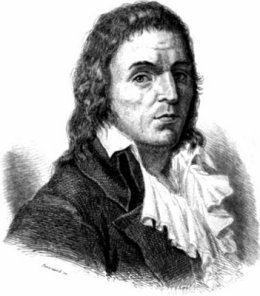 Antoine Quentin Fouquier de Tinville, the sinister mediocrity who gave villainy the cover of law, was guillotined this morning in 1795 to the delight of the Paris mob: the last head to roll in a batch of 16. In the dying light of day the great leader seemed to be rising out of his tomb as much as preparing to descend into it. Never was anything more bold than that great athlete’s countenance, never anything more formidable than the look of that profile which seemed to defy the knife. 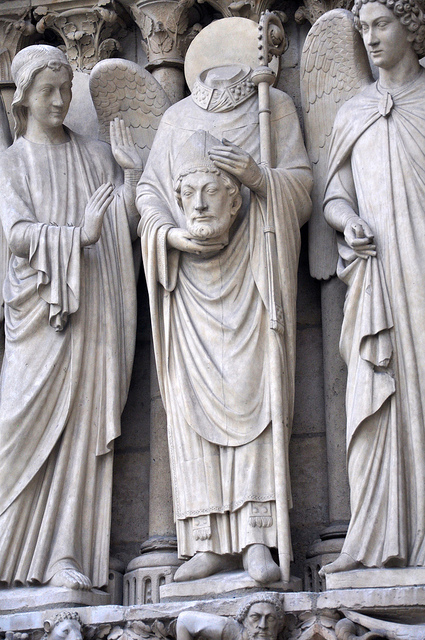 That great head, even as it was about to fall, appeared to be in the act of dictating laws. The famously ugly revolutionary had been the moving spirit overthrowing the monarchy of Louis XVI in 1792; as the firmest public minister holding up against the ensuing military collapse he was for a few weeks something close to the head of the government. Some credit him with saving Paris from military rout or internal anarchy during this time; some implicate him in the horrific September Massacres — and it may well be that neither view is mistaken. He was destroyed by his sometime ally Robespierre — Danton had returned from semi-retirement on his farm late in 1793 to engage this losing power struggle — and the two are easily, albeit simplistically, read as yin and yang in the Revolution. Like many before him, most especially the Girondins who had (fatally to both parties) scorned an alliance with the Dantonists, Danton sought to arrest the revolution where he stood. The confrontation that finished him was precipitated by Danton’s attempt — with the assistance of his longtime confederate Camille Desmoulins, the most notable of the other men to lose their heads this day — to apply the brake to the excesses of Robespierre’s Committee of Public Safety, that lethal organ he himself established as a pillar of order for a time of peril now abated. With the worst of the very real dangers to the Revolution checked, Danton in the Convention and Desmoulins in his fiery journalistic writings proposed to rein in the bloodbath and overturn the power of the sans-culottes. Danton’s action in those last days seems vacillating, uncertain; fate devours him. For Georg Buchner in Danton’s Death (here it is free in the original German), he’s paralyzed by the contradictions and uncertainties of an unknown new world in its birth pangs, despairing as all his good-natured philosophies drench themselves in gore. * Later codified into a regulation preventing any prisoner mounting a defense, the law would boomerang against its authors when Robespierre’s cadre was hailed before the Tribunal and condemned without a hearing. ** Another in the doomed party, Fabre d’Eglantine, was a writer who on the day of the execution complained of the loss of his verses, vers, a French word also meaning “worms.” Danton observed that he’d soon be making plenty more vers.